Australia Day, the commemoration of the landing of the British First Fleet in Sydney Cove is a day of division. Whilst a large majority of Australians feel positive about the day, that number falls to less than a quarter of indigenous Australians and, currently, only 15% want the day changed, following the lead of the Fremantle City Council. Barnaby Joyce, parading his typical level of knowledge and sensitivity in public affairs indicated his opposition to changing the date. The choice of date in itself is a rather strange beast. It does not, of course, represent first European contact with Australia. That was when the Dutchman navigator and colonialist Willem Jansz landed on the western coast of Cape York Peninsula in 1606 which resulted in violent conflicts. It certainly doesn't represent the founding of Australia as a country, that was, of course, Federation, on January 1st, 1901. It doesn't even represent the establishment of the colony of New South Wales - that occurred on February 7, 1776 with a formal proclamation, although that had already been down as a claim (rather than a reality) by James Cook on August 22, 1770 at Possession Island in Torres Strait. "I now once more hoisted English Coulers [sic] and in the Name of His Majesty King George the Third, took possession of the whole Eastern Coast from the above Latitude 38°S down to this place by the name of New South Wales." So what does January 26th represent? It represents a day of landing in Sydney Cove which formalised Cook's claim and which resulted in the establishment of a colony; a colony which claimed the land of the eastern seaboard of all of Australia (including Tasmania), with no specified western boundary. A claim which gave no consideration to the indigenous people who lived there, and certainly no respect towards their factual land claims; this is despite the explicit instructions to Cook that the British claim had to be "with the consent of the natives take possession of convenient situations in the name of the King... or if you find the land uninhabited Take Possession for His Majesty". It's not as if Cook hadn't encountered anyone on his way; when Cook first landed at Botany Bay in April 29, 1770 an altercation arose with some local Tharawal people in which an elder was shot led him to record in his log "all they seem'd to want was us to be gone". Indeed, it wasn't until June 6, 1835, that the first and only time that Europeans traded goods for lands directly with the traditional owners, through John Batman in what would be Melbourne. Batman's Treaty was declared void on 26 August 1835 by the Governor of New South Wales, Richard Bourke, with the establishment of the doctrine of Terra nullius, asserting that indigenous Australians did not own any land and therefore it could not be traded or otherwise negotiated with them. The distribution of the land was the sole decision of the Crown. The landing of the First Fleet as not without indigenous encounters, both with their landing in Botany Bay (Cadigal people), and Sydney Cove (Eora people), as recorded in the First Fleet journals.﻿ The French, also at Botany Bay at the same time, fired on local people. The establishment of the colony was not without resistance with the first recorded capital conflict occurring in Rushcutter's Bay in May. By the end of the year, in addition to dispossession of land, the British arrivals are capturing aboriginal people. By the end of the following year a war has broken out with punitive expeditions sent out by Phillip and indigenous resistance carried out by Pemulwuy which lasts for several years (with the British seeking a policy of extermination against the Bediagal people collectively), whilst further dispossession and displacements take place in contemporary Parramatta, Bankstown, and the Hawkesbury, and Georges River; the people there also resisted. Most extraordinary are the well-researched claims that the First Fleet deliberately released either smallpox or chickenpox which of course had a devastating effect on the aboriginal peoples (see: Warren, C., Smallpox at Sydney Cove - Who, When, Why? (2013)). What followed was the notorious "Frontier Wars". Population estimates suggest that the population of the aboriginal peoples was around 795,000 at the time of the arrival of the First Fleet, although there is significant variation in these estimates. In addition to the fatalities caused by dispossession and impoverishment, there was deliberate massacres (Bathhurst, Waterloo Creek, Myall Creek, Evans Head, Convincing Ground, Campaspe Plains, Gippsland, Warrigal Creek, Flying Foam, Kimberly, Burnett River, Hornett Bank, Battle Mountain etc, etc), poisonings (Whitside, Kilcoy), all contributing to a rapid decline of population. By self-indentification, the Australian Bureau of Statistics estimates that are currently 669,900 people of aboriginal descent. It is true that the latter half of the twentieth century saw some improvements. Years of activism by aboriginal people and their supporters led to the famous 1967 referendum which removed the ability of state governments to introduce legislation with regards to indigenous people (Western Australia had particularly onerous restrictions). In the 1970s, various bills establishing criteria for land rights were established in the Federal and state parliaments, and in 1988 proceedings began for what would overturn the legal fiction of Terra nullius with the Mabo case which established that native title existed prior to European arrival and was without originating from the Crown, and remained in effect unless extinguished by a loss of connection to the land. This would led to the Native Title Act of 1993, and the clarification that Native Title could co-exist with other titles, such as pastoral leases. Most importantly was the 1988 promise by the Australian Prime Minister, Bob Hawke, that there would be a Treaty with indigenous Australians by 1990, following the presentation of the Barunga Statement. Such a Treaty would have fundamentally changed the economic and political situation of indigenous Australians, and when it didn't eventuate Yothu Yindi released the famous song "Treaty". Even modest elements in self-determination, such as the establishment of ATSIC were closed down. All that remains in the proposal is a watered-down claim for Constitutional Recognition which is widely rejected by large numbers of indigenous people themselves. Many people claim that past injustices are not their responsibility. Such a view is both ahistorical and logically impossible, as it neglecting that current situations are a direct consequence of past events. Major health issues, such as lower life expectancy, higher levels of chronic illness, overcrowded housing, experience of violence and especially domestic violence, higher levels of imprisonment - all are a direct consequence of the past, as are continuing experiences of personal and systemic racism. 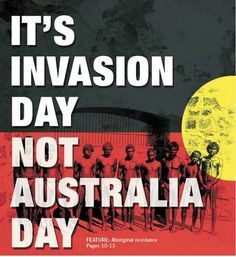 The reality is that protests around Invasion Day are not going to cease whilst indigenous people in this country are denied as Treaty. The impoverishment and dispossession of indigenous Australians from their natural sources of livelihood and common wealth are likewise best initiated and implemented through a Treaty. The indigenous peoples of Australia never gave up their sovereignty and as a result there is a firm legal foundation and arguably even a requirement for a Treaty to be established. Indeed, as part of the political maturity of the nation such a development could be combined with a national discussion about combining a Treaty with a Republic. Until then, Australia will continue to engage in an vile injustice, and justice by definition, involves making recompense and reconciliation to past and current wrongs. Commenting on this Story will be automatically closed on March 28, 2017. “My mother would sit and cry and tell me this; they buried our babies in the ground with only their heads above the ground. All in a row they were. Then they had tests to see who could kick the babies’ head off the furthest. One man clubbed a baby’s head off from horseback.